A limited-edition range of “Heisenberg” vodka, inspired by the hit TV show Breaking Bad, has been launched in the US. Named “Say My Name”, “Tread Lightly” and “The One Who Knocks” after well-known phrases in the show, the Blue Ice Vodka bottles have been approved by Vince Gilligan, executive producer and creator of Breaking Bad. Breaking Bad follows the story of chemistry teacher Walter White, who turns to drug dealing after he is diagnosed with cancer to ensure his family’s future financial security. Blue Ice Vodka was founded in 2002 and is produced from Idaho Russet potatoes and water sourced from the largest volcanic aquifer in the US. 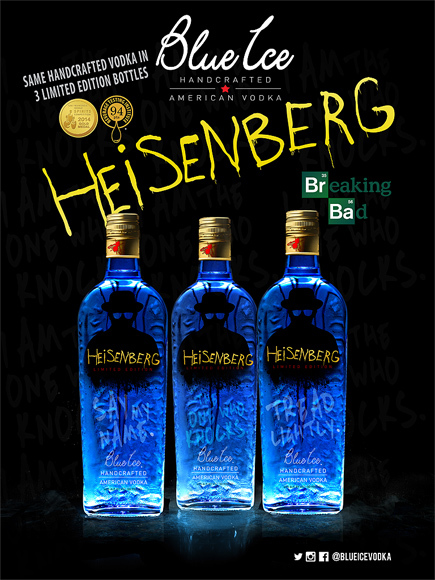 The Heisenberg Blue Ice Vodka is now in stores and available online in the US through 21st Century Spirits, through a partnership with Sony Pictures Television which owns the rights to the show. Earlier this year London event company Locappy announced plans for a Breaking Bad pop-up bar with guests were invited to “cook” cocktails in a converted RV.